A Philadelphia comedian claims to have posted a sign in a convenience store as a prank and it reveals a big misconception about people who receive government assistance. 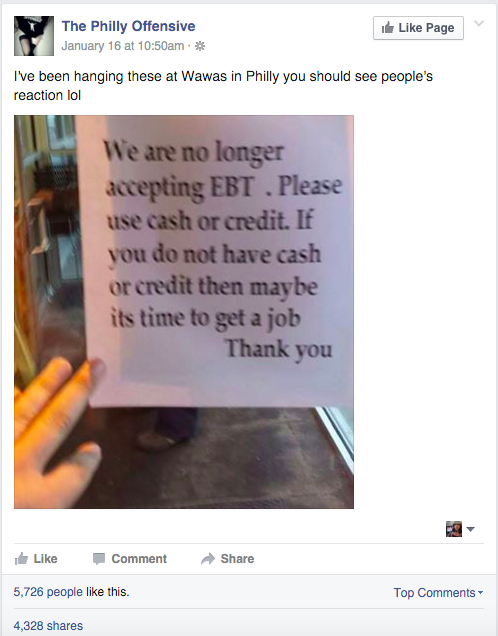 On Tuesday, Jay Jay McGuire, who uses the Facebook username “The Philly Offensive,” reposted a picture of a sign he said he hung on the door of a WaWa convenience store. He claimed that the manager of the store told him he had to take it down, but said he agreed with the sentiment of McGuire’s sign. His original post of the photo of the sign in January of 2016 had thousands of likes and shares. 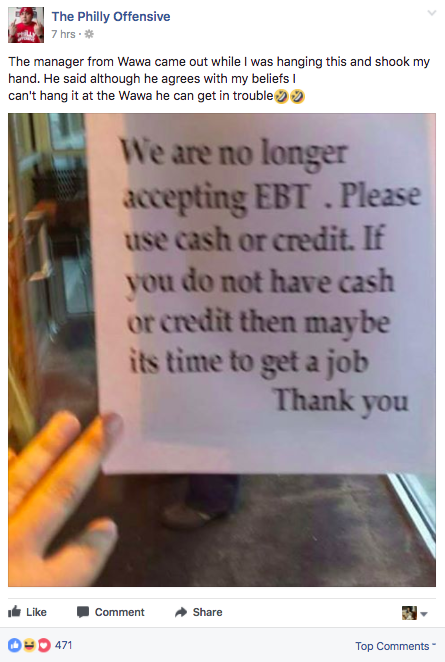 His repost of the sign reignited a conversation about people who use government assistance. Although it’s unclear whether McGuire truly believes the rhetoric of the sign, the comedian has a history of making controversial “jokes” about people who use government assistance. In December 2015, he shot a staged incident outside a convenient store, where he yelled at actors for using food stamps, and criticized their use of taxpayer money, according to the Philly Voice. EBT, or “electronic benefits transfer,” is the typical way for people enrolled in the Supplemental Nutrition Assistance Program (SNAP)—also known as food stamps—to access their benefits. 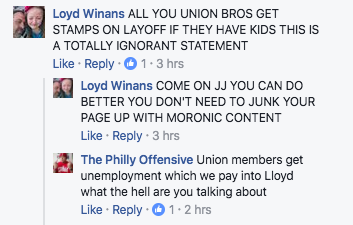 One commenter pointed out that McGuire’s sign was targeting recipients of EBT for food assistance, while ignoring people who accept unemployment benefits. Another user pointed out that telling SNAP users to “get a job” plays into a popular misconception that food stamp users don’t work. People on food stamps work. Millions of people who receive SNAP benefits also work. A recent reportwritten by Brynne Keith-Jennings and Vincent Palacios for the Center on Budget and Policy Priorities (CBPP) found that the share of households that receive SNAP benefits and also work has grown since the 1990s. In 2015, an average month saw 32 percent of households with a SNAP recipient also bringing in income. And in households with children and a non-disabled and non-elderly adults, 60 percent of SNAP recipients were working while receiving benefits. Additionally, the report noted that these figures for an average month likely undercount the overall number of workers because many only participate in the program in months when they are not working, as part of cycling in and out of eligibility. Nearly 15 million workers—about 10 percent of all workers in 2015—had at least one person in their household receive SNAP benefits. And as Keith-Jennings and Palacios noted, these benefits are becoming increasingly important to low-income workers who don’t make enough to support their families. Many low-income workers struggle with inconsistent hours, a lack of paid leave, and other benefits. “SNAP helps millions of workers, who may struggle with low wages, insufficient or changing hours, and overall job insecurity, feed their families,” they wrote.